Best Australian Comedy Writing unites some of the country’s funniest writers in one book that’s guaranteed to get you giggling. From memoir and satire to spoofs and silliness, this collection is an assortment of the weird and wonderful things that make us laugh. Australia is known for its thriving live comedy scene, but lack of support and confidence in our written comedy means we’re years behind the UK and the US when it comes to books. After the success of his memoir, A Funny Thing Happened on the Way to Chemo, stand-up comic and author Luke Ryan decided it was time to celebrate our wonderful nation of jokesters. 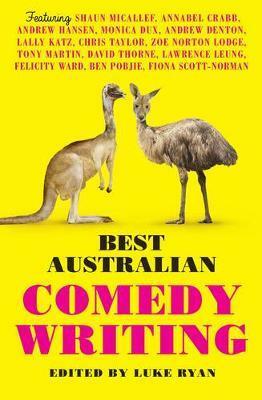 He wrangled 25 of Australia’s finest and funniest writers and rolled them into a single book of comedy gold.